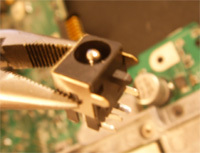 Power Jack Repair replacement fix specializes in dc power jack replacements repair and fixes on laptop computers. DC power Jack on the laptop is also known as an AC DC (direct current) power port, dc power input, laptop dc power connector, laptop charging port, notebook charge port, pc power socket, pin, computer power inlet, laptop prong, point, inlet, receptacle part, it is an inside piece in the laptop where the dc power plug (tip part of your AC adapter cable) plugs into. It usually goes bad if for quite some time you had to wiggle the plug to make the system power up or charge the battery, it also goes bad if you would accidentally drop the notebook computer from a table and it lands on a dc power plug that would push in and break the inside power jack connector of your laptop. Your laptop will be fixed and shipped out of here by the end of the next business day after we receive. Our full time jobs are taking the laptops apart, remove / desolder the dc power jack from the laptop’s motherboard, solder the new power jack to the motherboard, put your laptop back together, test it out, make sure everything works and everything was connected properly, package the laptop and send it back to you. We charge a flat rate fee of $100 for everything: labor, all parts AND return shipping. If you already taken the laptop apart yourself and want to send in just the motherboard then the total is $60. We offer 30 day money back guarantee and we also have a no fix no charge policy, if we can’t make your laptop work then you will get your money back minus the return shipping cost. We don’t have any diagnostic fees, bench fees, or any other fees. We have a 5 star rating on Facebook reviews, Yelp review, BBB, Google reviews if you are not happy with the service we simply give the money back. Chicago clients we have a second location 25 minutes north of downtown of Chicago. By appointment only at 710 mill circle #107 wheeling, IL 60090 Walk in clients please bring cash to pay for the repair once it is complete. We accept walk in clients at both locations. We are the first company in the U.S. to offer dc jack repair (power connector socket input port prong receptacle) service by mail in the year 2000, a decade later (2018) we still replace more dc power jacks than anybody else in the world. We offer 30 days money back guarantee, if you are unhappy with the repair within first 30 days of using the fixed laptop then let us know and we will give you the money back minus the cost of return shipping. We specialize in power jack replacements, we don’t work on any other computer issues except power jack repairs thus we have all parts in stock at all times. Our price is all inclusive, there is no up selling, there are no diagnostic fees of any kind, there is no bait and switch. We make the system work at an advertised price, or you don’t pay a cent. Communication is extremely important for our clients, so if you ever call us, we WILL pick up the phone and try to resolve whatever issue you might have. Write a message on google pages or facebook.